This post contains graphic images you may find disturbing. 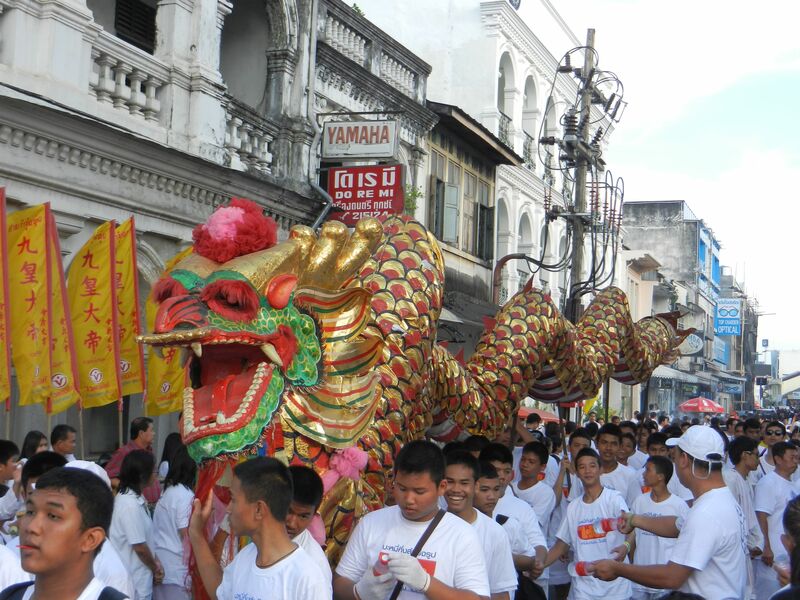 You have been warned……..
To say that we had culture shock while witnessing the main procession in Phuket Town at the Vegetarian Festival is an understatement. As much as I have tried to understand the rituals and learn about the history of this festival I do not, nor could I ever understand it. Like so many things in this world, if you are not a part of the culture you will always be an outsider looking in and most of the time you will not be able to comprehend the reasons behind it. 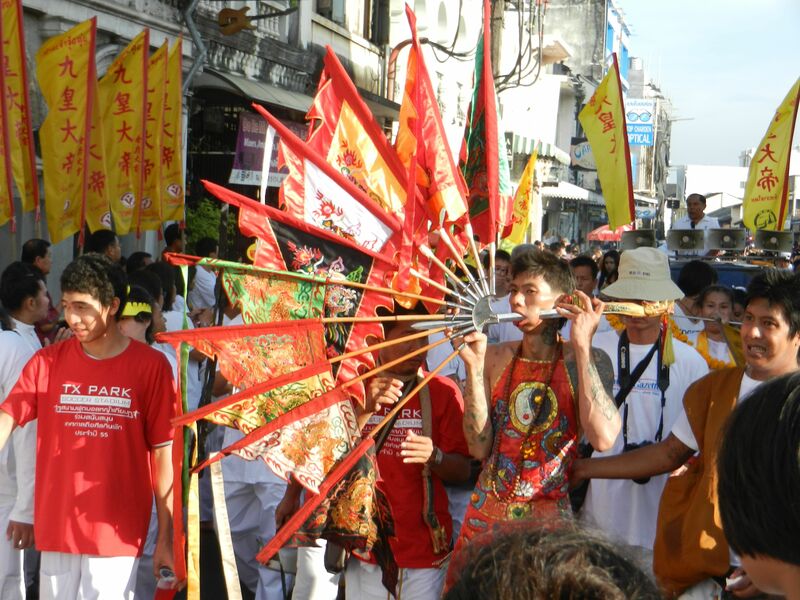 The history of the festival is easy enough to understand, its history begins in 1825 when a traveling opera from China came to the island to perform at a mining camp. Soon after arriving the entire opera troupe was struck with some sort of malady. 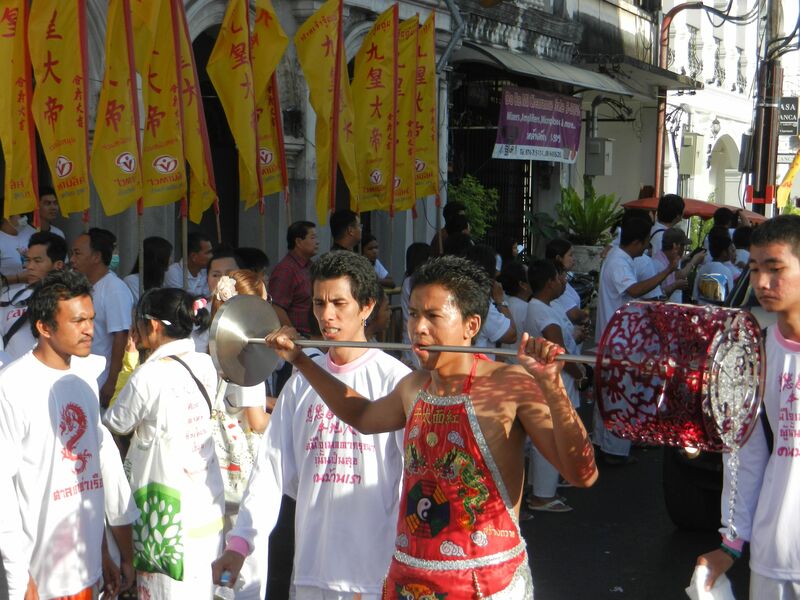 For nine days the troupe adhered to a strict vegetarian diet to honour two of the emperor gods, Kiew Ong Tai Teh and Yok Ong Sone Teh and the sickness disappeared amongst the troupe. 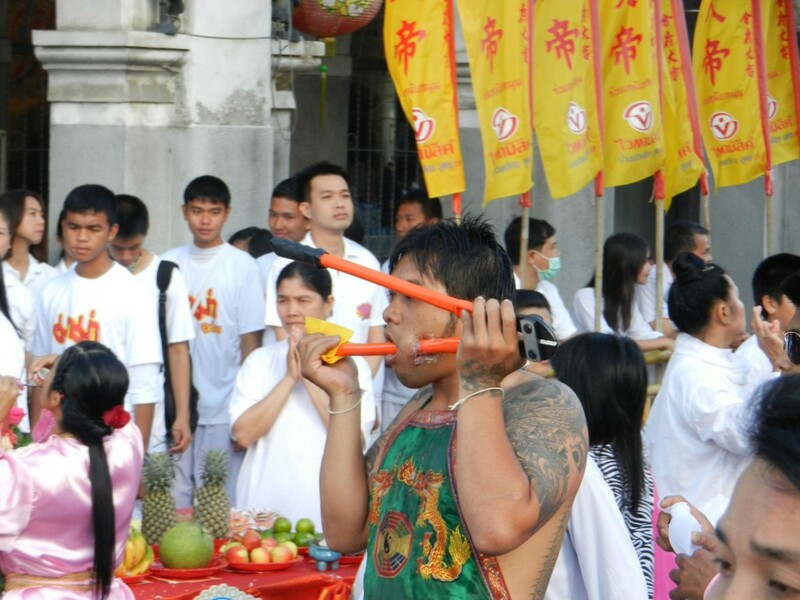 This ritual of cleansing intrigued the local inhabitants and they began their own tradition of cleansing for nine days in the ninth lunar month. 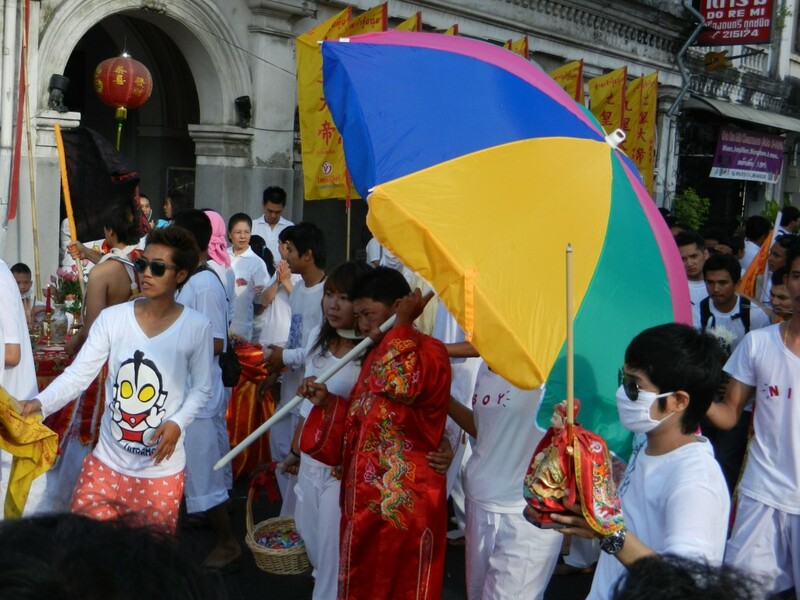 The festival is about cleansing body and spirit. Participants abstain from all vices, and do not eat or kill animals. Some people are chosen to be Ma Song, or entranced horses, and they perform acts of self mutilation in order to shift evil from their community into themselves, thus bringing their community good luck. Our first introduction was relatively mild in the grand scheme of things. 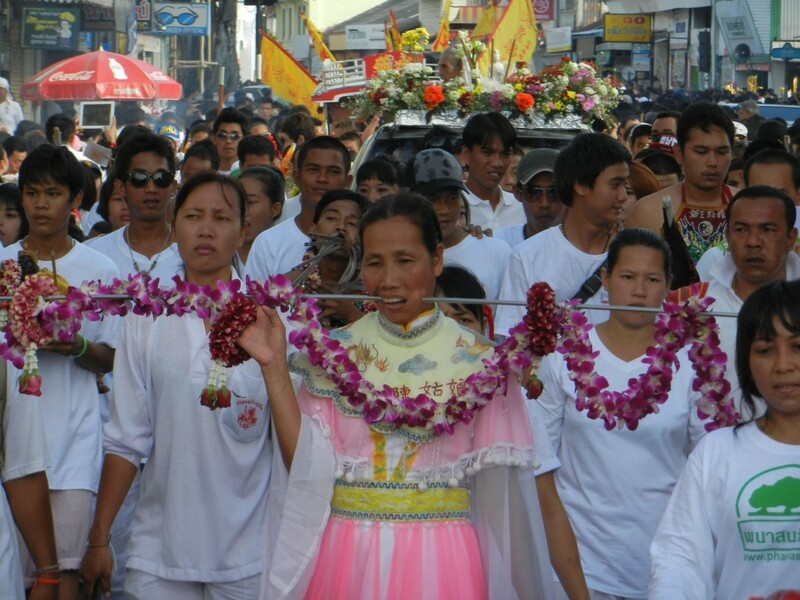 We went to a very small, local procession where we where the only foreigners in attendance. There was only one Ma Song that we could see…he had a metal skewer protruding through his cheek flesh. We also witnessed a few men swinging blades into their back flesh and cutting open their skin. The procession was short, and I do believe that we were actually in it at one point as we tried to navigate our way to the temple in our rented van! This morning was something else entirely. 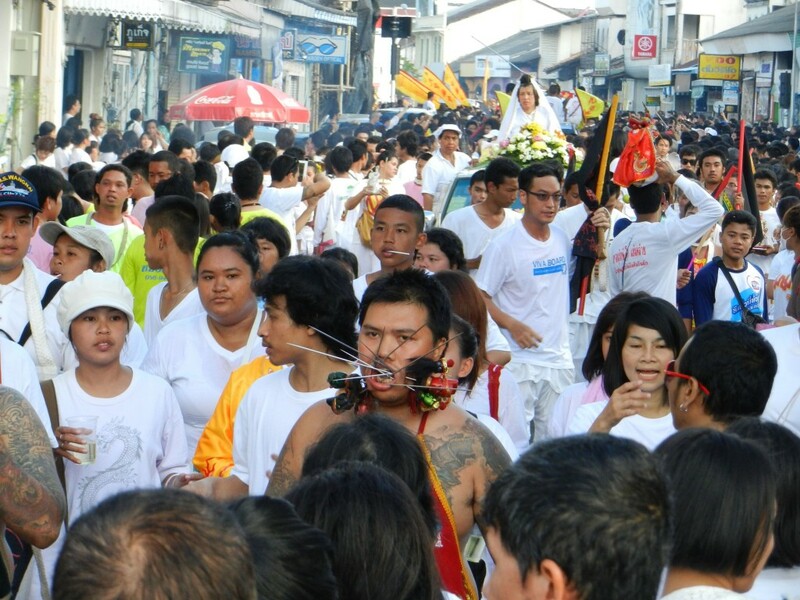 The same idea as the small procession we had witnessed but on a scale one thousand fold. There were literally hundreds of Ma Song with all sorts of household items shoved through their faces. It was shocking to put it mildly. My children watched the procession for about thirty minutes before Lan said, “People putting stuff through their cheeks is creepy, I don’t want to watch anymore.” The kids and I moved to the back of the crowd. I could still get glimpses of the procession but the boys only had views of the people standing in front of us. I would occasionally lift them up for something they would find interesting like the dragons or the decorated trucks that people threw candies or fruit out of. The procession went on and on and on. I’d say it lasted at least two hours. The people in it were walking very quickly as well so this gives you an idea of just how many people participated. 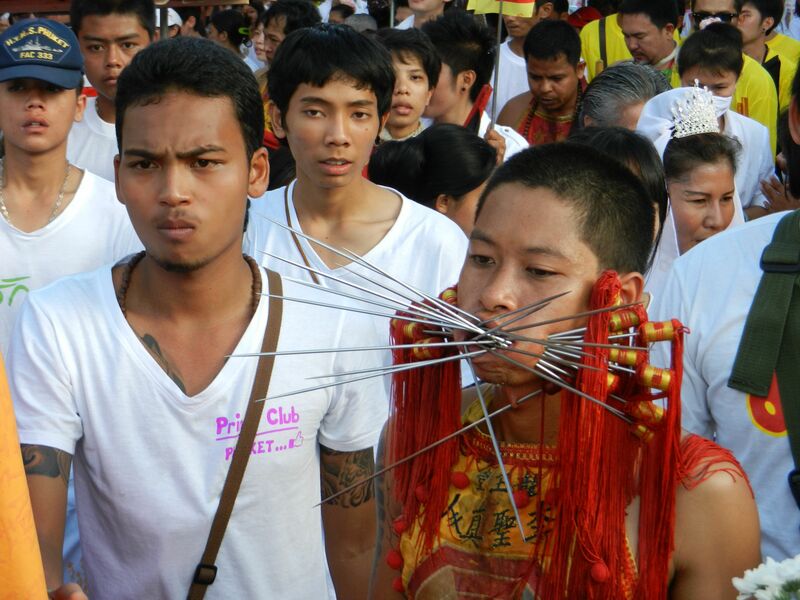 Of course not everyone in the procession was self mutilating. It seemed like every Ma Song had an entourage of people to help wipe away blood, give water, and help to support them if they needed it. There were also many, many people dressed up in costumes who were blessing the crowds. People of apparent importance rode in the back of trucks, blessing people with water, throwing candies, and throwing fruit. Jenn caught an apple ninja style and Kayden recovered an orange from the street. The last half an hour of the procession was very, very loud. 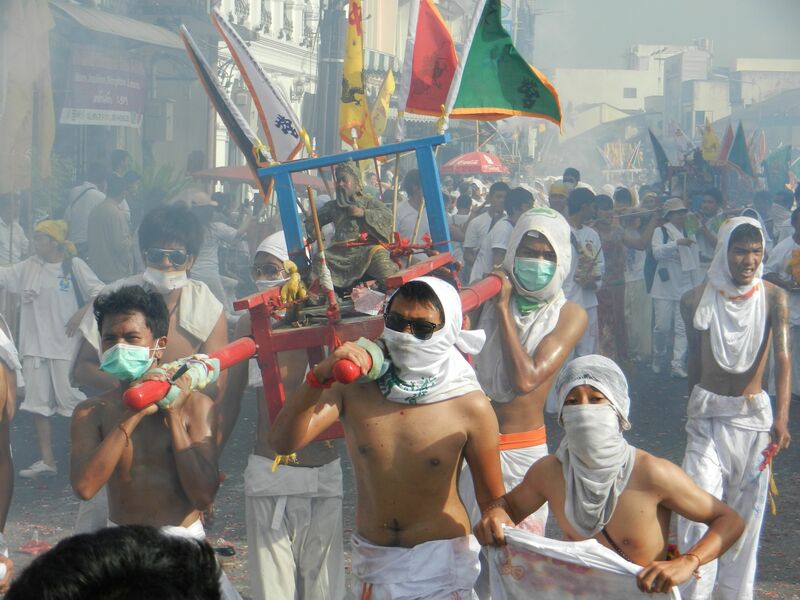 Statues of their gods were carried in sedan chairs by the devotees while fire cracker after fire cracker was lit and thrown into the street. This is when things got a bit hairy for me and the boys. The fire crackers were exploding into the crowd! We retreated to a small grassy space where we could still see the procession, but from a safe distance. 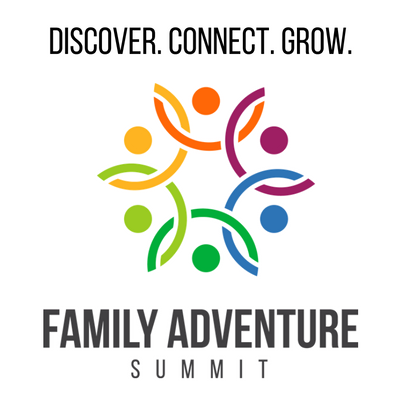 It was certainly a culturally broadening experience for all of us…something we will never forget. I’m still shaking my head at the self mutilation. I guess there are some things we are just not meant to understand. Seriously, we are the ones that our honoured by your presence. 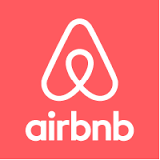 Thank you so much for welcoming us into your home and into your family. We couldn’t have asked for better friends to spend these last few weeks with and we are so blessed to share these experiences with you!